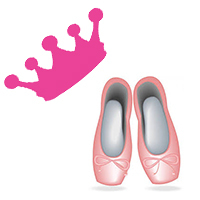 Does your dancer LOVE to dance and LOVE to dress up like a princess? If so, this is the perfect camp for you! At Princess Camp your dancer will get to experience Princess themed classes from 9:00am – 2:00pm Monday through Friday in Ballet, Hip Hop, Tumbling, Jazz and much more. Dancers will dance to their favorite Disney Princess songs, create fun arts & crafts, and learn a special Princess Dance to show all of their royal subjects on the last day. This camp is sure to please all of your little Princesses! Ballet shoes, tap shoes, and a comfortable pair of sneakers.